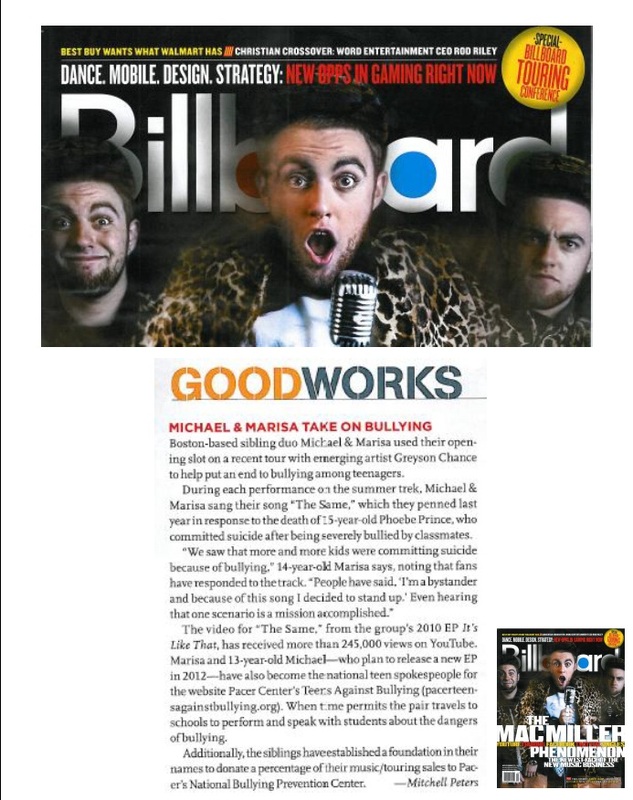 Check out the November 12th issue of Billboard Magazine and you will see US in the Good Works section! All our fans know that bullying is an issue we hold close to our hearts and we’re doing our part to put an end to it! Help us spread the word and together we can stop bullying! This entry was posted on November 7, 2011 at 11:31 pm and is filed under News, Press. You can follow any responses to this entry through the RSS 2.0 feed. You can leave a response, or trackback from your own site. I am writing you on behalf of Red Dog Farm Animal Rescue Network in North Carolina. On March 24th, 2012 Red Dog Farm will be holding their 4th annual “Dogs on the Catwalk” fundraiser. The event will be held at Triad Stage in downtown Greensboro, NC and includes a canine fashion show and silent auction, with 100% proceeds going towards helping animals. Red Dog Farm Animal Rescue Network is a nonprofit 501(c)(3) public charity dedicated to the rehabilitation, fostering, and adoption of animals of all sizes (dogs, cats, horses, bunnies, etc, etc). With your popularity we believe that an autographed item from you for the silent auction would help in making the event a HUGE success. We would greatly appreciate if you could donate a signed item, maybe a signed picture of you and your pet (if you have one), if you don’t have a pet maybe you could send an signed photo, script, or any other item that you think would do good in the auction. Our tax id number is #20-5428178. I know that whatever you send will help us reach our Goal. All donated items are tax deductible. Please feel free to contact me at 336-478-4132 or email me at brandiq@marketamerica.com if you have any questions –Thank you for your time. HAVE A WONDERFUL DAY. Max’s Story Max, the Great Dane (pictured below), was surrendered to us unneutered, overdue on vaccines, abused, and under socialized. He had spent most of his days in an 8 x 8 dog lot owned by a woman who “loved” him and a man who hated him. He had never had heartworm prevention and was severely infested with heartworms. His total care cost $2,000 and many hours of volunteer time to help him heal. Thanks to fundraisers like Dogs on the Catwalk, we had the resources to treat his heartworms, neuter him, and help him overcome emotional scars from his previous trauma. Today, he is a happy, healthy boy owned by a woman who truly adores him.